Saint Lucia ( /ˈluːʃə/; French: Sainte-Lucie) is a sovereign island country in the West Indies in the eastern Caribbean Sea on the boundary with the Atlantic Ocean. Part of the Lesser Antilles, it is located north/northeast of the island of Saint Vincent, northwest of Barbados and south of Martinique. It covers a land area of 617 km2 (238 square miles) and reported a population of 165,595 in the 2010 census. Its capital is Castries. The French were the island's first European settlers. They signed a treaty with the native Island Caribs in 1660. England took control of the island from 1663 to 1667. In ensuing years, it was at war with France fourteen times, and rule of the island changed frequently (it was ruled seven times each by the French and British). In 1814, the British took definitive control of the island. Because it switched so often between British and French control, Saint Lucia was also known as the "Helen of the West Indies". Representative government came about in 1840 (with universal suffrage from 1953). From 1958 to 1962, the island was a member of the West Indies Federation. On 22 February 1979, Saint Lucia became an independent state and a member of the Commonwealth of Nations. Saint Lucia is a mixed jurisdiction, meaning that it has a legal system based in part on both the civil law and English common law. The Civil Code of St. Lucia of 1867 was based on the Quebec Civil Code of 1866, as supplemented by English common law-style legislation. It is also a member of Organisation internationale de la Francophonie. One of the Windward Islands, Saint Lucia was named after Saint Lucy of Syracuse by the French, who were the island's first European settlers. It is the only country in the world named after a woman. Legend states French sailors were shipwrecked here on 13 December, the feast day of St. Lucy, thus naming the island in honor of Sainte Lucie. Castries' harbour was protected by a system of 60 surrounding forts. Along the top of Morne Fortune there are six military sites, building work by the French started in 1768, and the British completed the work by 1890. They include Fort Charlotte (Old Morne Fortress), the Apostle's Battery (1888-1890), The Powder Magazine built by the French in the 1750s, Provost's Redoubt (1792) built as a lookout point, and the Combermere barracks. In the mid-twentieth century, Saint Lucia joined the West Indies Federation (1958 – 1962) when the colony was dissolved. In 1967, Saint Lucia became one of the six members of the West Indies Associated States, with internal self-government. In 1979, it gained full independence under Sir John Compton of the conservative United Workers party (UWP), who served as prime minister from 1982 to 1996, after which he was succeeded by Vaughan Lewis. Dr. Kenny Davis Anthony of the Labour Party was prime minister from 1997 to 2006. In 2006, the UWP, again led by Compton, won control of parliament. In May 2007, after Compton suffered a series of small strokes, Finance and External Affairs Minister Stephenson King became acting prime minister and succeeded Compton as prime minister when the latter died in September 2007. In November 2011, Anthony was re-elected as prime minister for a third time. In the June 2016 elections the UWP assumed power again, under Prime Minister Allen Chastanet. The volcanic island of Saint Lucia is more mountainous than most Caribbean islands, with the highest point being Mount Gimie, at 950 metres (3,120 feet) above sea level. Two other mountains, the Pitons, form the island's most famous landmark. They are located between Soufrière and Choiseul on the western side of the island. Saint Lucia is also one of the few islands in the world that contains a drive-in volcano. Average daytime temperatures are around 29 °C (84.2 °F), and average nighttime temperatures are around 24 °C (75.2 °F). Since it is fairly close to the equator, the temperature does not fluctuate much between winter and summer. Average annual rainfall ranges from 1,300 mm (51.2 in) on the coast to 3,810 mm (150 in) in the mountain rainforests. The geology of St. Lucia can be described as composing three main areas. The oldest, 16–18 Ma, volcanic rocks are exposed from Castries northward and consist of eroded basalt and andesite centres. The middle, central highlands, portion of the island consists of dissected andesite centres, 10.4 to 1 Mya, while the lower southwest portion of the island contains recent activity from the Soufriere Volcanic Centre (SVC). This SVC, centered about the Qualibou depression, contains pyroclastic flow deposits, lava flows, domes, block-and-ash-flow deposits, and explosion craters. This depression's perimeter includes the town of Soufriere, Mount Tabac, Mt. Gimie, Morne Bonin, and Gros Piton. 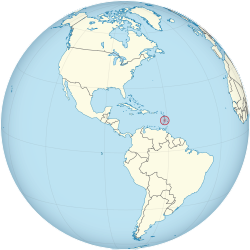 At 10 kilometres (6.2 mi) in diameter, though the western portion is open towards the Grenada basin, the depression formed as recently as 100 kya. The depression is noted for its geothermal activity, especially at Sulphur Springs and Soufrière Estates, a phreatic eruption in 1776, and recent seismic activity (2000–2001). Saint Lucia is a Commonwealth realm. Queen Elizabeth II is the Head of State, represented on the island by a Governor-General. The prime minister is normally the head of the party commanding the support of the majority of the members of the House of Assembly, which has 17 seats. The other chamber of Parliament, the Senate, has eleven appointed members. Saint Lucia maintains friendly relations with the major powers active in the Caribbean, including the United States, the United Kingdom, Canada, and France. 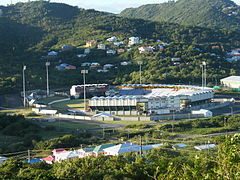 Saint Lucia has no extant international disputes. Saint Lucia became the 152nd member of the United Nations on December 9, 1979. As of January 2018, Cosmos Richardson, who presented his credentials on 22 February, 2017, was Saint Lucia’s representative to the United Nations. Saint Lucia entered the OAS system on 22 February, 1979. The United Nations categorizes Saint Lucia as a Small Island Developing State, a designation similar to a developing country with a few substantial differences due to Saint Lucia's island nature. The country's gross domestic product in purchasing power parity was estimated at $2.384 U.S. dollars in 2017, ranking 194th among all countries. The services sector accounted for 82.8% of GDP, followed by industry and agriculture at 14.2% and 2.9%, respectively. About 61.5% of the population is Roman Catholic, of the island. Another 25.5% belong to Protestant denominations, (includes Seventh Day Adventist 10.4%, Pentecostal 8.9%, Baptist 2.2%, Anglican 1.6%, Church of God 1.5%, other Protestant 0.9%). Evangelicals comprise 2.3% of the population and 1.1% are Jehovah's Witnesses. In addition, about 1.9% of the population adheres to the Rastafari movement. Other religions include Islam, Bahá'í Faith, Judaism, and Buddhism. For sailing enthusiasts, the annual Atlantic Rally for Cruisers (ARC) race begins in the Canary Islands and ends in Saint Lucia. The year 2015 marked the ARC´s 30th year of existence. Every November, the race attracts over 200 boats and 1,200 people to sail across the Atlantic to the Caribbean. The island's cuisine is a unique blend of West African , European (mainly British and French) and East Indian cuisine; this creates dynamic meal dishes such as macaroni pie, Stew chicken, rice and peas, fish broth or fish water, and soups packed full with fresh locally produced vegetables. Typical essential foodstuffs are potatoes, onions, celery, thyme, coconut milk, the very hot scotch bonnet peppers, flour, and cornmeal. All mainstream meat and poultry are eaten in St. Lucia; meat and seafood are normally stewed and browned to create a rich gravy sometimes served over ground provisions or rice. The island is also home to the famous fried dough, known by many as a bake or Johnny Cake. These bakes can be served with different sides, such as saltfish which is either sautéed or lightly fried along with red, green peppers, onions, and seasoned well. This is the most common way for bake to be prepared, though it can also be served with meats such as stewed chicken or beef. ^ a b c "About St. Lucia". Castries, St. Lucia: St. Lucia Tourist Board. Archived from the original on 5 June 2013. https://web.archive.org/web/20130605065323/http://www.stlucia.org/planner/about.asp. "The official language spoken in Saint Lucia is English although many Saint Lucians also speak a French dialect, Creole (Kwéyòl)." ^ "Saint Lucia". The World Factbook. Central Intelligence Agency (CIA). https://www.cia.gov/library/publications/the-world-factbook/geos/st.html. Retrieved 2016-10-23. ^ a b c d "St. Lucia". International Monetary Fund. 2016. http://www.imf.org/external/pubs/ft/weo/2017/01/weodata/weorept.aspx?pr.x=31&pr.y=2&sy=2016&ey=2021&scsm=1&ssd=1&sort=country&ds=.&br=1&c=362&s=NGDPD%2CNGDPDPC%2CPPPGDP%2CPPPPC%2CLP&grp=0&a=. ^ a b "Population & Vital Statistics". Central Statistics Office of St. Lucia. Archived from the original on 19 November 2016. https://web.archive.org/web/20161119182317/http://192.147.231.244:9090/stats/index.php/statistics/population. Retrieved 18 November 2016. ^ "Human development indices". Undp.org. 2008. Archived from the original on 12 January 2012. https://web.archive.org/web/20120112083827/http://hdr.undp.org/en/media/HDI_2008_EN_Tables.pdf. ^ Hartston, William (2016-02-21). "Top 10 facts about St Lucia". http://www.express.co.uk/life-style/top10facts/646162/Ten-things-you-never-knew-about-St-Lucia. ^ a b Harmsen, Jolien; Ellis, Guy; Devaux, Robert (2014). A History of St Lucia. Vieux Fort: Lighthouse Road. pp. 16–21. ISBN 9789769534001. This article incorporates text from a publication now in the public domain: Chichester, Henry Manners (1894). "Montagu, John (1688?-1749)". In Sidney Lee. Dictionary of National Biography, 1885–1900​. 38. London: Smith, Elder & Co.
^ Cameron, Sarah (2013). St Lucia & Dominica Footprint Focus Guide: Includes Fort-de-France ... (1 ed.). Footprint Travel Guides. p. 32. ISBN 9781909268319. https://books.google.co.uk/books?id=9MH9AgAAQBAJ&lpg=PA32&ots=C17ulm-q_7&dq=bagshaw%20st%20lucia&pg=PA32#v=onepage&q=bagshaw%20st%20lucia&f=false. Retrieved 1 November 2017. ^ Cameron, Sarah (2013). St Lucia & Dominica Footprint Focus Guide: Includes Fort-de-France .... p. 33. ^ Brew, Simon (24 September 2014). "Billy Connolly interview: What We Did, Muppets, X-Files". http://www.denofgeek.com/movies/billy-connolly/32212/billy-connolly-interview-what-we-did-muppets-x-files#ixzz4Mjg2Tx2D. ^ "Allen Chastanet sworn in new St Lucia PM". Jamaica Observer. 7 June 2016. http://www.jamaicaobserver.com/news/Allen-Chastanet-sworn-in-new-St-Lucia-PM. Retrieved 7 June 2016. ^ a b (2013) "Volcanic stratigraphy and geochemistry of the Soufriere Volcanic Centre, Saint Lucia with implications for volcanic hazards". Journal of Volcanology and Geothermal Research 258: 126–142. DOI:10.1016/j.jvolgeores.2013.04.011. ^ "UWP wins Saint Lucia elections". St. Lucia Times. 6 June 2016. Archived from the original on 12 October 2016. https://web.archive.org/web/20161012161038/https://stluciatimes.com/2016/06/06/uwp-wins-saint-lucia-elections. Retrieved 7 June 2016. ^ "Member State: Saint Lucia". 2017. http://www.oas.org/en/member_states/member_state.asp?sCode=STL. ^ "Foreign Account Tax Compliance Act (FATCA)" (in en-us). https://www.treasury.gov/resource-center/tax-policy/treaties/Pages/FATCA.aspx. ^ "Agreement between the Government of the United States of America and the Government of Saint Lucia to Improve International Tax Compliance and to Implement FATCA". 19 November 2015. https://www.treasury.gov/resource-center/tax-policy/treaties/Documents/FATCA-Agreement-St-Lucia-11-19-2015.pdf. ^ "Referenced by the Royal Saint Lucia Police". Rslpf.com. 1961-11-04. http://www.rslpf.com/hist.htm. Retrieved 2016-12-21. ^ "Referenced by Nation Master". Nationmaster.com. http://www.nationmaster.com/country/st-saint-lucia/mil-military. Retrieved 2016-12-21. ^ "Small Island Developing States". New York: United Nations Department of Economic and Social Affairs Division for Sustainable Development. https://sustainabledevelopment.un.org/topics/sids. Retrieved 13 March 2018. 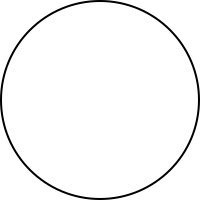 ^ "List of Small Island Developing States". New York: United Nations Department of Economic and Social Affairs Division for Sustainable Development. https://sustainabledevelopment.un.org/topics/sids/list. Retrieved 13 March 2018. ^ "Saint Lucia". CIA World Factbook. Central Intelligence Agency. https://www.cia.gov/library/publications/the-world-factbook/geos/st.html. Retrieved 13 March 2018. ^ "Saint Lucia Economy: Population, GDP, Inflation, Business, Trade, FDI, Corruption". Heritage.org. http://www.heritage.org/Index/Country/SaintLucia. Retrieved 2016-12-21. ^ "Oecd.org". Archived from the original on 17 June 2009. https://web.archive.org/web/20090617032129/http://www.oecd.org/dataoecd/18/23/34792376.xls. Retrieved 4 March 2010. ^ a b Bureau of Western Hemisphere Affairs (U.S. Department of State) (12 August 2011). "Background Note: Saint Lucia". United States Department of State. https://www.state.gov/r/pa/ei/bgn/2344.htm. Retrieved 11 November 2011. "Languages: English (official); a French patois is common throughout the country." ^ a b "Kweyolphone Countries Take Stock of the Language's Growth". Government of Saint Lucia. Archived from the original on 2 April 2012. https://web.archive.org/web/20120402104905/http://stlucia.gov.lc/pr2005/may/kweyolphone_countries_take_stock_of_the_languages_growth.htm. Retrieved 22 August 2008. ^ "Welcome to the International Organisation of La Francophonie's official website". Paris: Organisation internationale de la Francophonie. http://www.francophonie.org/English.html. Retrieved 11 November 2011. ^ "The World Factbook — Central Intelligence Agency" (in en). https://www.cia.gov/library/publications/the-world-factbook/geos/st.html. ^ a b c d e "Human Development Report 2009 – Saint Lucia". hdrstats.undp.org. Archived from the original on 8 July 2010. https://web.archive.org/web/20100708001830/http://hdrstats.undp.org/en/countries/data_sheets/cty_ds_LCA.html. Retrieved 16 November 2009. ^ "St. Lucia Culture". Flights To St Lucia. http://www.flightstostlucia.com/culture-of-st-lucia. Retrieved 12 March 2010. ^ "Charles eager to learn from Dessie Haynes". Windies cricket. Archived from the original on 8 February 2013. https://web.archive.org/web/20130208130119/http://www.windiescricket.com/node/5438. Retrieved 29 July 2012. ^ "Nadine George awarded MBE". ESPN Cricinfo. 14 November 2005. http://www.espncricinfo.com/women/content/story/225789.html. Retrieved 16 September 2012. ^ "Darren Sammy and Nadine George cop top sports award". Government of Saint Lucia. 21 February 2005. http://web.stlucia.gov.lc/pr2005/february/darren_sammy_and_nadine_george_cop_top_sports_award.htm. Retrieved 16 September 2012. 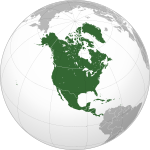 ^ "Bureau of International Labor Affairs (ILAB) – U.S. Department of Labor". Dol.gov. Archived from the original on 27 November 2013. https://web.archive.org/web/20131127004607/http://www.dol.gov/ilab/media/reports/iclp/tda2001/saint-lucia.htm. Retrieved 16 November 2009. ^ "Saint Lucia Colleges and University Directory. Universities and Colleges in Higher Education of (Saint Lucia ). Universities, Colleges, Departments, Schools, Institutes of Saint Lucia, version: 2009-11-16,1687412353". University-directory.eu. http://www.university-directory.eu/Saint-Lucia/Saint-Lucia.html. Retrieved 16 November 2009. Trimble, Copeland (1876). Historical record of the 27th (Inniskilling) Regiment from the period of its institution as a volunteer corps till the present time. William Clowes. https://archive.org/details/historicalrecor02goog.